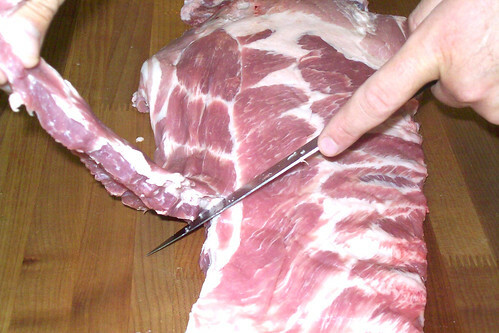 With meat side up cut off rib tips following line of fat. This gives the ribs a nice uniform thickness and is aesthetically pleasing. Don’t throw out the trimmings – throw them on the grill as well – they’re mighty tasty! 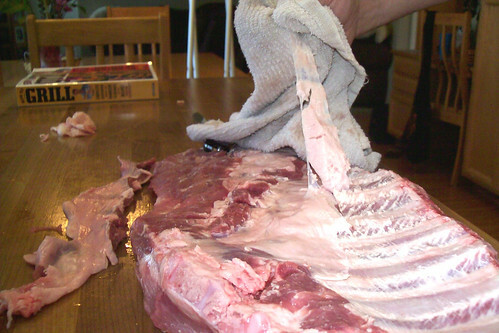 Optional – Marinade ribs in fruit juice or apple cider/lemon juice mixture for 2 hrs. – I just sprayed these with Dole Orange Peach Mango Juice or better known as OPM (Opium) at our house. 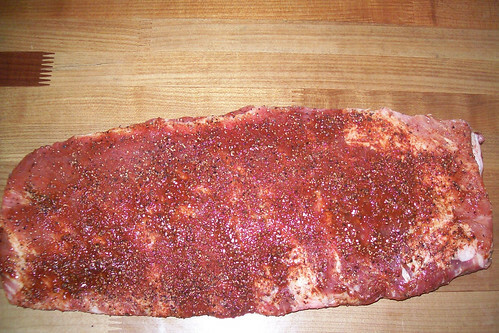 Rub ribs with rub and let sit covered in the refrigerator 2-12 hrs. 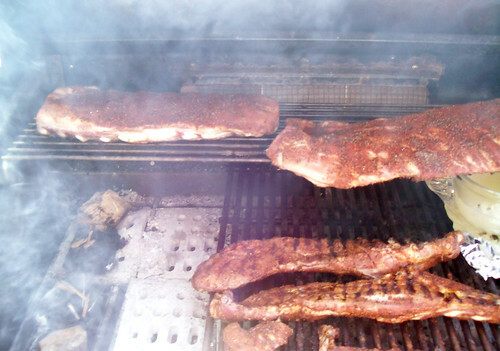 An hour or two before grilling take them out of the fridge and let the ribs sit at room temperature! Soak wood chips in water or fruit juice. Put wood chips and or chunks in the wood box. Set grill up for indirect grilling/smoking. I have a gas grill so I fire all burners to get it warmed up. Put a bowl with mixture of 1/2 lemon juice, 1/2 water over burner opposite the wood chips. When the grill is warmed up turn heat down to achieve 250° cooking temp. On my grill I leave the outside two burners on low. Place ribs on warming rack. 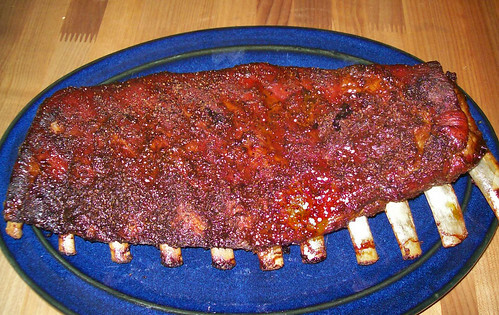 Every 1/2 hour spray ribs with fruit juice of choice (juice used in optional marinade above). After 2 1/2 hours cover with BBQ sauce of choice. If they are drying out you can put them in foil at this time too. Mix all ingredients in medium saucepan, bring to boil, reduce heat and simmer for 5 minutes. Mix everything except last three ingredients. Simmer for 30 minutes. Stir in remaining ingredients and simmer for 10 more minutes. Me too! John doesn’t eat anything with bones and ribs are my FAVORITE! Oh my, those look WONDERFUL! Such a LOT OF WORK, but so rewaqrding!! Good thing you made a whole mess of them. Wish I were there to eat them with you!!! We brought these to a gathering at a friends house and everybody loved them. The downside is there were no leftovers. 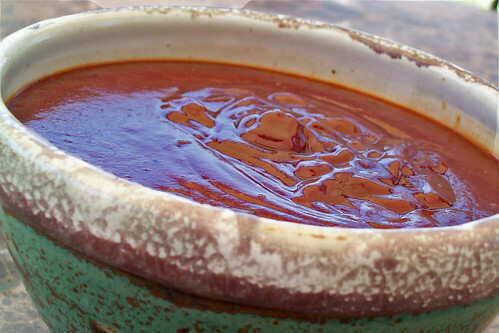 OMG, I am so trying your North Carolina bbq sauce – that sounds amazing! I’ve always loved a vinegar based bbq sauce – yum! I am making a pork roast for lunch, and just made your NC bbq sauce – it ROCKS! I did use splenda and splenda brown sugar because I am diabetic, but that’s all I changed. may I kindly suggest getting a wood grill like a weber? Unless you clean those ceramic coals every time you use them, the taste of the grill is going to be unfavorable to those ribs. It’s so easy to light a fire using natural wood charcoal. NEVER use lighter fluid. you might as well drink a cup of gasoline!